My friend took this photo with his iPhone 4. I’m impressed with the quality of the photo – it’s pretty sharp for a phone camera. 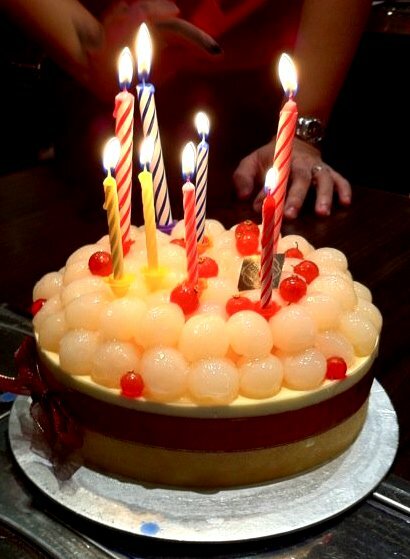 The few of us had our usual monthly dinner – Korean BBQ at Jangshou – and we had a cake to celebrate in advance the birthdays of the two Scorpios amongst us. I ignored the number of candles on the cake (age is just but a number!) and focused on enjoying the very yummy longan chiffon cake. And why do people think that I’m going to Korea BECAUSE of Rain…?! Can’t blame them. It is quite obvious why people put “going to Korea” and “Rain” together but I have to say that I AM NOT THAT MAD.